This cake is inspired by the uber-popular Israeli sweet lemonade that’s always punched up with fresh mint called limonana. Limonana is really just a simple drink, but it has taken Israel by storm over the last 25 years. It’s a delicious, super sweet lemonade—tooth-achingly sweet—like a good Mississippi sweet tea. What makes it unique is the addition of copious amount of bright, verdant, incredibly fresh mint leaves. It’s a snappy addition that takes the lemonade from good to great. Israeli Hebrew is often marked with anglicized words, but not this drink. 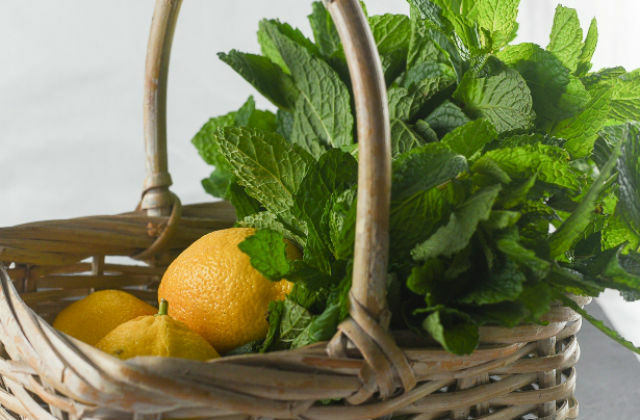 Without even naming it through an official Ministry of Made-up Words (with apologies to Monty Python, it actually has existed), it’s a clear amalgam of lemon in Hebrew (limon) and mint in Arabic (nana), creating a drink word that even chefs Yotam Ottolenghi and Sami Tamimi could love. But it’s all about the taste, which is bright and lively and endlessly refreshing. You can find limonana-flavored sorbets and sherbert and the lemon and mint—or even a lime and mint—would be a great foil for a granita. 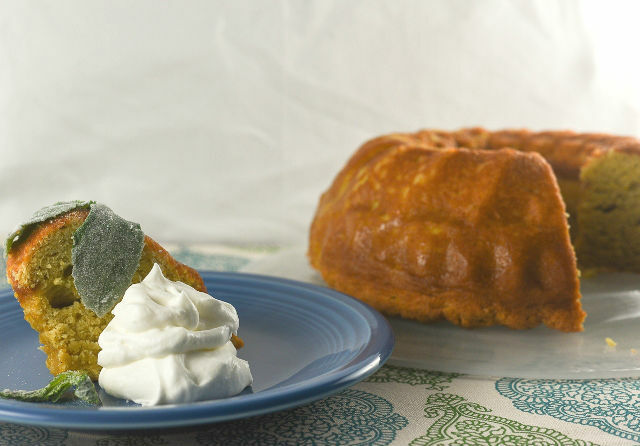 Light and delicate, this lemony chiffon cake is lovely paired with a minted whipped cream and candied mint. Superfine sugar, also called caster sugar, is granulated sugar that has been ground into very fine crystals. It dissolves quickly and is excellent for use in drinks, meringues, puddings, candies and lighter baked goods such as angel food cakes. If a recipe specifies superfine sugar, do use it; it makes a difference. If you don’t have any, just grind your granulated sugar in a food processor for 2 minutes, until it is very, very fine. To make your own mint oil, heat 1 cup canola oil in a small saucepan set over medium-low heat, add the mint, and cook for about 5 minutes until the oil is very warm (if you have a candy thermometer, it will read about 180°F). It should not boil or sputter; it is, essentially, poaching. Set up a fine-mesh strainer lined with cheesecloth over a medium-sized mixing bowl. Remove the pan from the heat and let stand until the oil reaches room temperature. Then, using an immersion blender, blend until smooth. (You can also do this in a regular blender.) Pour the blended mixture through the sieve and let it slowly drip through. The oil can used immediately, or kept refrigerated in an airtight container for up to 2 weeks. When beating egg whites an impeccably clean bowl is a must; even a bit of grease can keep them from firming up to form soft or stiff peaks. Preheat the oven to 325°F. Spray a 7-inch bundt pan with nonstick vegetable oil spray and dust it lightly with flour. In a large mixing bowl, sift together the flour, baking soda, salt, and ¾ cup of the sugar and set aside. In another bowl, whisk together the egg yolks, vegetable oil, lemon juice, vodka or water, lemon zest, and vanilla. Add the flour mixture, and whisk for about 1½ minutes, until smooth and thick. In the bowl of a stand mixer fitted with a whisk attachment (or, if you are using a handheld electric mixer, in a large mixing bowl), beat the egg whites at medium speed until foamy. Add the cream of tartar and beat for about 1 minute, gradually increasing the speed to high, until soft peaks form (see Kitchen Tips). Gradually add the remaining tablespoon of sugar and beat for about 2½ minutes at high speed until stiff peaks form and the eggs are stiff and almost dry. Fold one-third of the egg whites into the batter and gently stir to lighten the mixture. Add the next third, folding carefully, leaving some white streaks. Add the last third and fold gently until the last white streaks just barely disappear. Pour the batter into the prepared pan. Using an offset spatula, smooth the top. Bang the pan on the kitchen counter once. Bake for 30 to 35 minutes, until a cake tester inserted in the middle comes out clean and the cake is golden. While the cake is baking, make the candied mint leaves (see Kitchen Tips): Line a baking sheet with parchment paper and place the leaves on it in a single layer, With a pastry brush, brush the leaves very lightly with the egg white. Sprinkle with half the sugar, allow to dry for 5 minutes. Turn the leaves over, brush with the egg white, sprinkle with the remaining sugar and allow to fully dry. Remove the cake from the oven and gently invert it, still in the pan, onto a cooling rack and let stand until fully cooled and the pan is cool enough to touch. Turn the pan right-side up. Run a knife between the cake and the side of the pan. Place a serving platter that is slightly wider than the pan over the cooled cake, so that the bottom of the platter faces up. Holding the pan with one hand and pressing the plate firmly onto the pan with the other, invert them so that the plate is on the bottom. Lift up the cake pan to reveal the cake. Just before you are ready to serve, make the whipped cream (see Kitchen Tips): Using a stand mixer, electric mixer or whisk, pour the cream into a mixing chilled bowl. Whip the cream until soft peaks form. (If using an electric or stand mixer, beat the mixture on high for about 60 seconds.) Add the sugar, vanilla, and mint oil to the cream and whip just to combine. 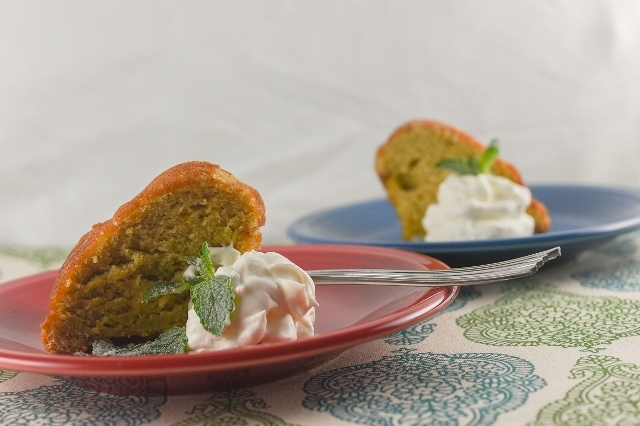 Serve slices of cake garnished with whipped cream and candied mint leaves. Egg creams are light, refreshing but still somehow a little rich.